Outfit your patio with an imaginative outdoor sectional series of exceptional quality. 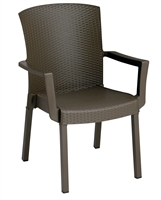 The Sojourn series offers a robust seating experience that easily rearranges according to usage. 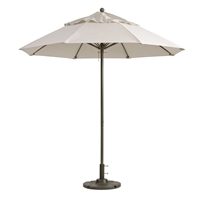 Outfitted with industry-leading Sunbrella® fabric cushions, synthetic rattan weave, UV protection, powder-coated aluminum frame, immensely enjoy your outdoor time with a series that enhances patio, backyard or poolside areas. This installment of the series is an Outdoor Patio Sofa. Available in Tuscan, Navy, Antique Beige. Experience the outdoors with exceptional comfort and quality. 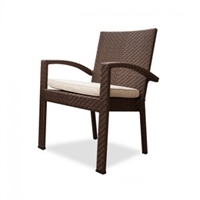 Summon offers an exquisite two-tone synthetic rattan weave, plush all-weather cushions with industry-leading Sunbrella® fabric, UV protection, and a sturdy powder-coated aluminum frame. Featuring rounded arms and an elegant modern look, Summon is an avant-garde outdoor sectional series well-equipped for enhancing patio, backyard or poolside gatherings. 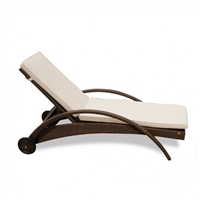 This installment of the series is a double outdoor patio chaise. 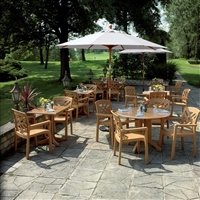 Harbor your greatest expectations with this luxurious solid teak wood outdoor set. Marina has a seating arrangement perfect for every member of your crew as you breathe the fresh crisp air of a day spent with friends and family. Known for its natural ability to withstand extreme weather conditions, teak is the wood selection of choice for long-lasting outdoor furnishings. Now you can enjoy Marina’s durable construction and all-weather cushions, alongside a modern design that persistently looks new and welcoming. 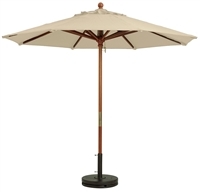 Harbor your greatest expectations with this luxurious solid teak wood outdoor set. Marina has a seating arrangement perfect for every member of your crew as you breathe the fresh crisp air of a day spent with friends and family. Known for its natural ability to withstand extreme weather conditions, teak is the wood selection of choice for long-lasting outdoor furnishings. Now you can enjoy Marina’s durable construction and all-weather cushions, alongside a modern design that persistently looks new and welcoming. Natural with White Cushion. Overall Product Dimensions: 76"L x 29.5" W x 12.5" H.
Harbor your greatest expectations with this luxurious solid teak wood outdoor set. Marina has a seating arrangement perfect for every member of your crew as you breathe the fresh crisp air of a day spent with friends and family. Known for its natural ability to withstand extreme weather conditions, teak is the wood selection of choice for long-lasting outdoor furnishings. Now you can enjoy Marina’s durable construction and all-weather cushions, alongside a modern design that persistently looks new and welcoming. Natural with White Cushion. 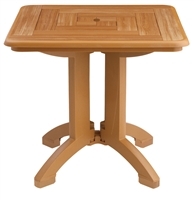 32" square or 38" round in molded melamime teakwood finish. Harbor your greatest expectations with this luxurious solid teak wood outdoor set. Marina has a seating arrangement perfect for every member of your crew as you breathe the fresh crisp air of a day spent with friends and family. Known for its natural ability to withstand extreme weather conditions, teak is the wood selection of choice for long-lasting outdoor furnishings. Now you can enjoy Marina’s durable construction and all-weather cushions, alongside a modern design that persistently looks new and welcoming. Natural. The Bentwood Bar Stool is constructed of a chromed steel frame and base. 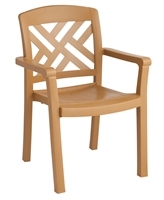 It has a bent plywood seat with natural wood finishes. This stool operates on an adjustable hydraulic piston. This item is made similar in style to the award winning LEM Piston Stool. Perfect for entertaining guests at your own bar at home, or for stylish seating around the counter.